Glee Karaoke Revolution (Nintendo Wii 2011) Cleaned & Polished - FREE SHIPPING! The hit dance workout craze returns with a new roster of musicians, dance styles, and routines, and the new globe-trotting World Tour mode in Zumba Fitness World Party. Players can once again tone their body and improve their endurance as they take on more than 40 new routines set to over 30 dance styles, including the new Plena, Blues, Capoeira, and Girly Funk styles. In World Party gamers travel to Brazil, Hawaii, and five more locations, unlocking new songs and dance styles, and learning about local culture and customs in the process. 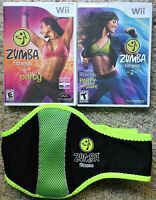 Zumba Fitness World Party offers 14 celebrity Zumba instructors to guide gamers through 45 pre-determined routines, and players can always come up with their own workout. Gamers can set personal fitness goals, keep tabs on the calories they burn with the Progress Tracker Plus, unlock motivational rewards, and take on three different intensity levels. Wii gamers can join three friends for multiplayer routines, and as always the action is hands-free thanks to the included Wii Remote holster. This is a great game for anyone who is looking to try and exercise more because it is a fun and exciting way to do it! I have lot weight just by playing this game alone. I take a class every night and there are so many dances that it never gets old! You can also play on the world mode where you can travel to each part of the world and learn different types of dances. I would definitely recommend this game! Graphics are good and it's real people dancing rather than computer people. A ton of fun! I felt the songs in this one are too slow. When I Zumba I want to move. The backdrops and gameplay were OK. Personally I am not going to be keeping. I played it 4 or 5 times and just can't get into it. 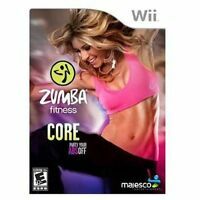 Definitely my least favorite of the Wii Zumba games. The graphics on it are amazing and clear you see a real person. This game is fun it has real people on the screen to show you what to do its a great workout and a great product if your a person who doesn't like going to the gym then I would get this product and try it out. Great game with a super variety of songs and moves. Get ready to sweat. I am loving this game so far. It is super fun and doesn't feel like I'm exercising. I have lost a few pounds so far and I am noticing more toned legs and abs.